with the CL crown in the centre as shown in the second BS below. I cannot find any information about this anywhere and wonder if anyone knows. 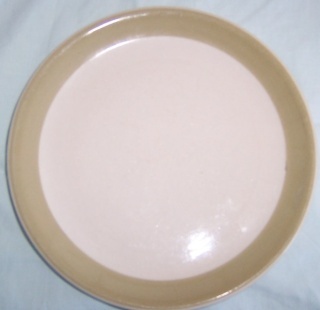 I have a Crown Lynn dinner plate marked Crown Lynn Mode pattern 135 with beige band like this plate, BUT it also had five small Maori patterns spaced evenly around the edge of the plate. 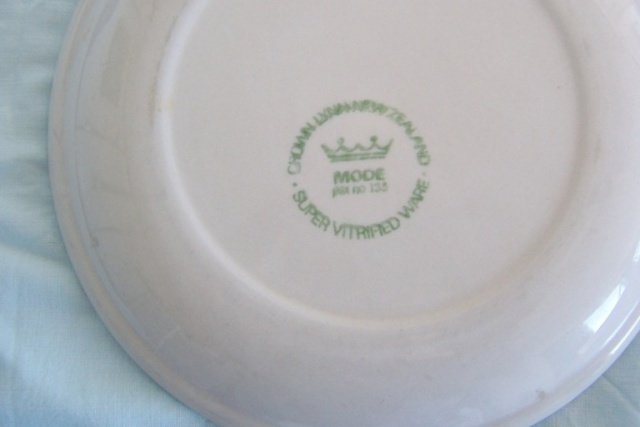 Anyone know anything about this plate, it is Mode 135 but has this extra Maori pattern, I suspect it would be rare as I cannot find anything about it except one sold on TM in 2012, price now not on auction. Any ideas anyone? Value? 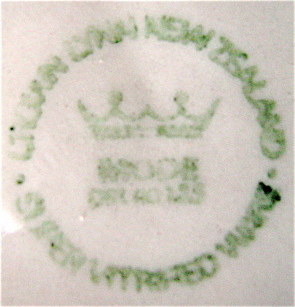 Also when was this plate produced approximately if known. can you post a link to the old listing? 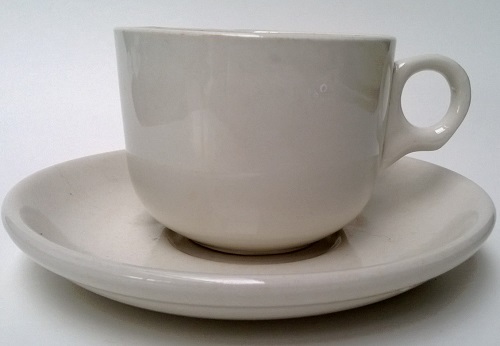 Hi, I noticed some of these plates in an art & object catalogue that I was looking through last night ..... I will find it again and let you know, though if I recall correctly there wasn't a great deal of info. Lot 269A - 26 plates with olive green band border with tekoteko figures, 6 Large - 20 smaller. Estimate to sell for from $200 - $400 .... so around $10 to $20 each by my reckoning. I would definitely say that these belonged to a Marae. Wow that is really interesting, thank you so much I really appreciate your help, they sound relatively rare then. I'll have to decide whether to hang on to them and wait it out or sell. Their value will increase with time, as will all Crown Lynn, so perhaps I will just keep them a bit longer. We will see. Thank you Crown Lynn Detective!!!! 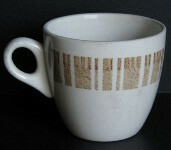 It's also good to know the name if the Maori pattern is Tekoteko. 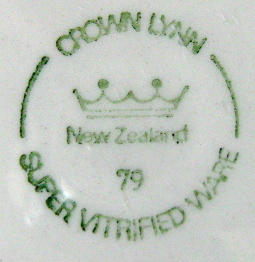 Side note: I was in Paeroa yesterday enjoying the antique shops and saw a lot of Crown Lynn there, in particular Arkwrights has lots of patterns, what a joy to spend the morning this way. I thought the spotty pattern was Mode, since they were in a set and also being the super vit. 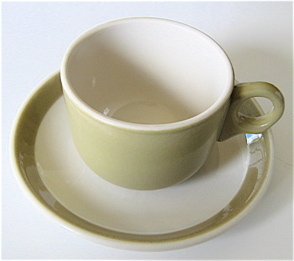 type cups....... but I see a plain cup and saucer on this thread that looks like its mode ( all one colour) .. any thoughts .. anyone? 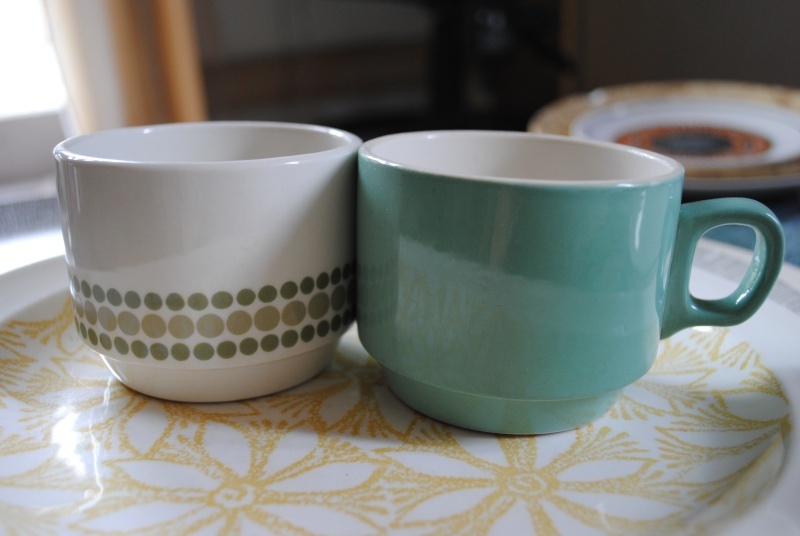 This next photo shows the pot compared with "cafe style stacking cups"
I thought that the Mode cups were the same shade as the band around the edge ....? 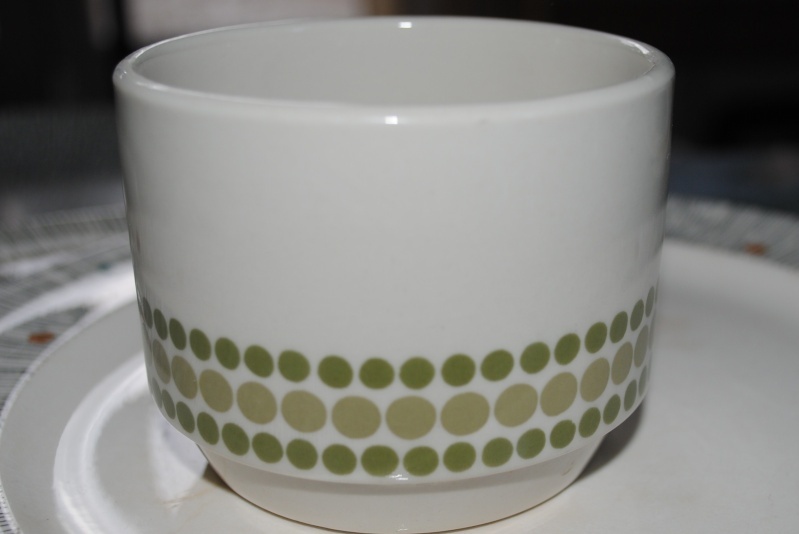 I've seen the dot pattern, but have never seen a name for it yet. Yes, I would call that pot a sugar basin. I have some shape numbers in Mode from the Decoration Advices that I must check out ! The spot pattern is not "mode" thanks for the pictures you sent via PM. 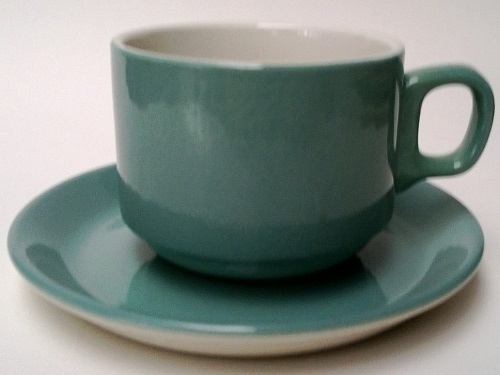 There are three vitrified Hotel Ware cup shapes that were made in that Oyster Colour Glaze that Mode has and I haven't been able to work out which is which yet.